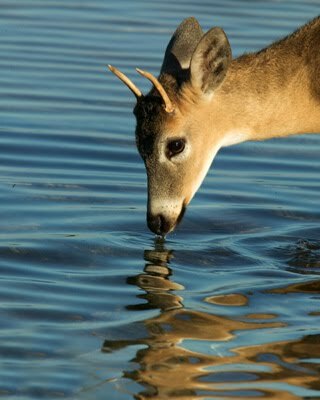 “As a deer pants for the water brooks, so my soul pants for you, O God. My soul thirsts for God, for the living God” (Psalm 42:1-2). Not only did I learn this verse as a young child, but someone along the way put it into a song that I remember singing a lot. Needless to say, it is not only a verse, but a concept that is very familiar. There in would lie the ultimate problem. Could the idiom, “Familiarity breeds contempt” apply to Scripture? Or worse could it apply to our relationship with God. Obviously if it does, it points out where the problem lies… within our own hearts. At moments like these when my heart seemingly drifts away from the one and only source of life and from the Creator God who loves me and is constantly pursuing me, I am reminded that my only source of satisfaction is found in Him. My only source for life comes from Him. I need Him and should desire Him as much as a deer longs for water… or as much as I need water. The Psalmist goes on to say in Psalm 63, ” O God, you are my God, I seek you, my soul thirsts for you; my flesh faints for you, as in a dry and weary land where there is no water. So I have looked upon you in the sanctuary, beholding your power and glory” (vs. 1-2). That is the essence of what it means to love God – to long for Him and find satisfaction in Him. John Piper says it well, “God is most glorified in me, when I am most satisfied in Him.” It seems so simple in concept yet so amazingly difficult in application. I find that I can be so easily drawn into the trappings of this world and consumed with the ritual of ‘life’ that I lose the longing. I dream of the day when creation is reordered and our lives truly find and reach complete satisfaction in Him… in His presence. Until that day, we are challenged to live a life of longing… of continual pursuit of a God who loves us and gave Himself for us. By His amazing grace, He is sanctifying us and creating a deeper thirst in us as our journey continues. I have tasted that the Lord is good and I want to spend my days in a satisfied relationship with Him, all the while inviting others to come and find satisfaction in the living water that never runs dry!